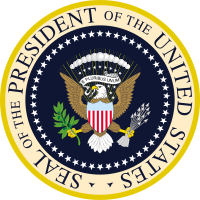 The presidential seal was last changed in 1959 by adding the 50th star for Hawaii. 42 100px Bill Clinton 1993 2001 Democratic Albert A. Gore, Jr.
↑ "How To Address The President; He Is Not Your Excellency Or Your Honor, But Mr. President". The New York Times. August 2, 1891. http://query.nytimes.com/gst/abstract.html?res=9D06E3D9143AE533A25751C0A96E9C94609ED7CF. ↑ "USGS Correspondence Handbook - Chapter 4". Usgs.gov. 2007-07-18. http://www.usgs.gov/usgs-manual/handbook/hb/431-2-h/chap4.html. Retrieved 2012-11-15. ↑ "Models of Address and Salutation". Ita.doc.gov. http://www.ita.doc.gov/ita_sec/Address%20and%20Salutation.htm. Retrieved September 4, 2010. ↑ The White House Office of the Press Secretary (September 1, 2010). "Remarks by President Obama, President Mubarak, His Majesty King Abdullah, Prime Minister Netanyahu and President Abbas Before Working Dinner". WhiteHouse.gov. http://www.whitehouse.gov/the-press-office/2010/09/01/remarks-president-obama-president-mubarak-his-majesty-king-abdullah-prim. Retrieved July 19, 2011. ↑ "Exchange of Letters". Permanent Observer Mission of Palestine to the United Nations. September 1978. http://www.un.int/wcm/content/site/palestine/cache/offonce/pid/12020. Retrieved July 19, 2011. This page was last changed on 17 December 2014, at 20:20.